Using Plastic Sheeting and other methods, a Composite or Combination Slurry Wall groundwater Barrier can be customized to solve a specific problem. Generally, composite slurry walls are made by adding another material, such as a plastic sheet, into a soil bentonite or cement bentonite slurry wall to improve the overall properties of the barrier. Plastic sheets are added to improve the water or gas permeability. Steel members can be added to improve the structural properties of the composite wall. Combination slurry wall systems feature a combination of different slurry wall techniques. 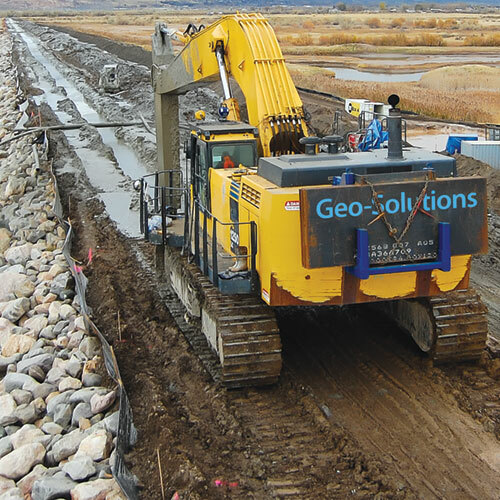 An example combination slurry wall system might consist of CB panels incorporated into a SB slurry wall in order to traverse a steep slope or jet grouted panels used to encase buried utilities along the wall alignment. When bio-polymer trench drains are included in the system, the combination slurry wall system can simultaneously slow groundwater flow and facilitate its extraction. There are numerous kinds of composite slurry walls and combination slurry wall systems. More information on combination slurry wall systems is available in our sections on bio-polymer trench drains and permeable reactive barriers. Use of the slurry method allows for the economical insertion of vertical panels or elements into the ground in a narrow self-supporting trench, even below the groundwater table. Use of plastic panels may be necessary in extremely aggressive groundwater environments or in cases where methane or other gas migration needs to be prevented. The use of the slurry trench technique provides a way to install steel sheeting in difficult driving conditions. Minimum cost for maximum benefit using two or more slurry wall technologies. Capability to solve isolated constructibility issues with minimum cost and risk. Capability to modify groundwater patterns by diverting, extracting or containing groundwater with one continuous system. Generally, the slurry wall methods used to excavate the slurry trench are the same as in any of the other methods described elsewhere on our website (see slurry walls). The plastic panels can be inserted using a variety of methods chosen based on the type of sheet and type of joint selected. 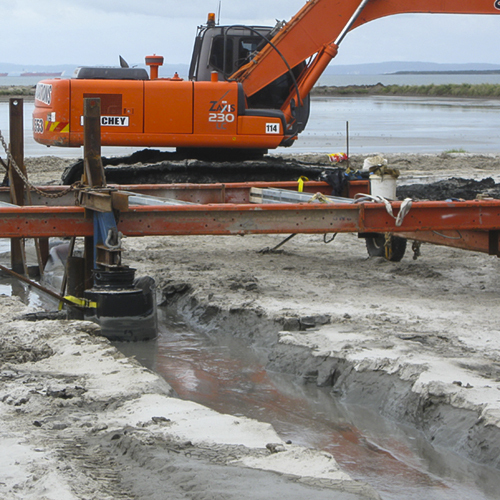 The pictures below show plastic panels being inserted into excavated slurry supported trenches. 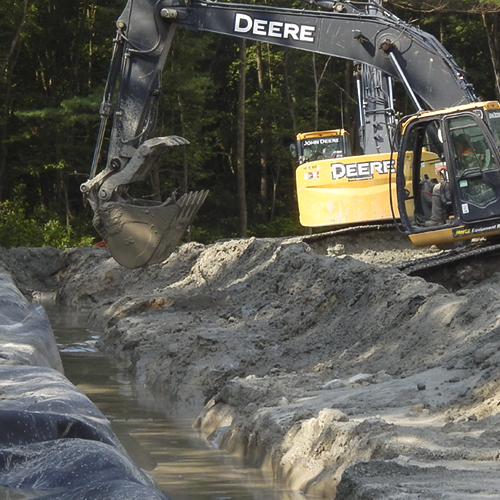 The first picture shows plastic sheets being inserted with overlapped joints into a slurry trench. A wide overlap, slurry, and pressure from the backfill seal the joint. The second picture shows plastic sheets being inserted with interlocking joints into a slurry wall. The interlock joints can be held together with a sealant for a more positive seal. A temporary steel frame suspended by a crane is used to hold the sheets in place while the interlock is made. Generally, composite barrier walls have permeability values that are too low and too complex to measure. 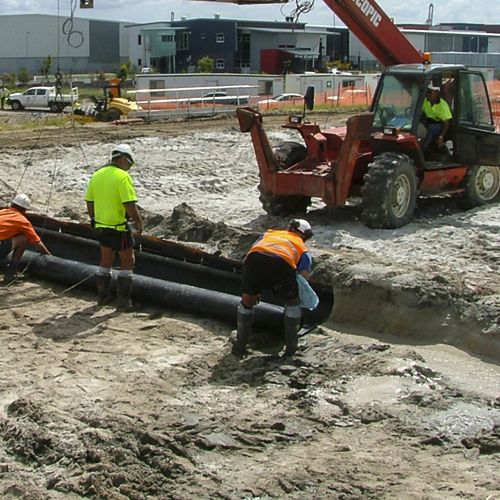 For example, on a recent project in Australia, a composite slurry wall with a plastic sheet and overlapping joints sustained a vacuum for a period of over a year, indicating a very tight system. On another project in Arizona a composite slurry wall with a plastic sheet and interlocking joints has performed well without measurable leakage for over 10 years. While composite slurry walls are more costly and more difficult to install, they provide an additional safety factor in performance. Combination slurry walls are most often designed to address the needs of a specific project, but some combinations occur repeatedly in similar applications. Perhaps the most common combination is the soil-bentonite slurry wall installed in parallel with a bio-polymer trench drain. This combination is often employed around landfills or other contained waste facilities that need to dewater inside the facility without removing and treating large volumes of groundwater from outside the facility. 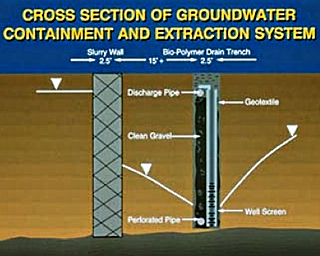 A cross section of a typical combination slurry wall system is shown in the schematic below.